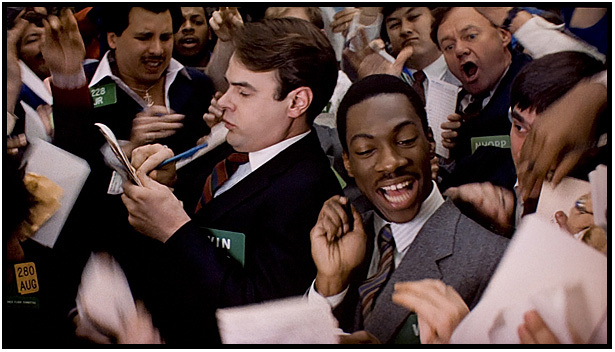 “Trading Places.” I should probably rewatch this. Racism. Privilege. Teaching yoga in Africa because you’re afraid of your black neighbors. All pretty “safe” talking points, right? Good lord! Sometimes the week just has a mind of its own. Anyway, sticking with our unofficial theme for this week, here are two videos that demonstrate a little race role reversal. The second video is from South Africa and was, I believe, banned for being too offensive (there is scant info on this). I’m not sure if that’s true, or which community was actually offended, but it was a semi-big deal when it came out. For those who are not familiar with the SA cultural signifiers in this commercial, I’ll explain: The white people are playing the role of the black people. Pretty straight forward. On the whole I find role reversal videos to be great places for people in the privileged classes to start looking at racial issues they may be unaware of. Sometimes this approach backfires, however, like when a rich white kid does a school project on the homeless and lives on “the streets” for a night, and then writes a paper about how they “were homeless for a night.” Again, a great place to start, but spending twenty-four hours wandering the blocks does not a homeless person make. Might make a pretty effing frightened rich white kid with a new appreciation for having a lawn to cut, but that whole you-can-go-back-home bit sorta gets in the way. On a kinda unrelated, but still cool, note: I started looking around the internet and found two more banned South African commercials. All very intense stuff. Now what was that yoga rave supposed to accomplish again? Brava Babs! Role reversal is actually and exercise we often use in diversity training. Did anyone here every see the Travolta film “White Man’s Burden”? A whole flick about role reversal in an alternate world. Thanks Dyspeptic. Nice that someone was in the audience with a camera before network execs pulled. On the subject of South Africa…..it’s worth viewing “A Dry White Season” with Donald Sutherland one of the few films I know of that starts with the “white man’s burden” premise and turns it upside down. A wealthy Afrikaaner landowner learns that his gardener’s son was killed by South African police and naively starts asking questions. He’s rebuffed, then shunned by his family, then by all of polite society, and eventually he gets so drawn in, he “goes native. : The film explores the deeper emotional terrain of racial “solidarity” in an unusually compelling way. He doesn’t go looking to “help.” He’s impelled to act by his gardener’s grief by the affront to his “property.”. It turns the NIMBY premise on its head. And the Black South African activists who never really trust him are so moved by his doggedness and courage that in the end they feel impelled to risk their own lives to avenge him – by finding and murdering his killer. He becomes a Brother – posthumously. Imagine if an American yogi were actually “killed in the line of duty”? (whatever that means!). First of all, the press release would make it sound like the Second Coming of the Holocaust. But let’s be real: the chances of this happening in a setting of humble “service” are rather slim. It’s far more likely that a drunken Hindu mob will string Shiva Rea up for “blasphemy,” and little Indian schoolchildren will fight over who gets to wear her sandals. Just wanted to pass along this great article written by an activist living on the streets for a week during a “Street Retreat” in San Francisco. The giant belching, farting soul-devouring Moloch that is Yoga rages on, Babs or no Babs. Who ya gonna call?